JNN 13 Jan 2104 Damascus : Syrian troops have success to liberate the holy shrine of Sayeda Sukayna or Sakina (AS), the daughter of Imam Hussein (AS), during an operation near the Syrian capital, Damascus, Media reports. 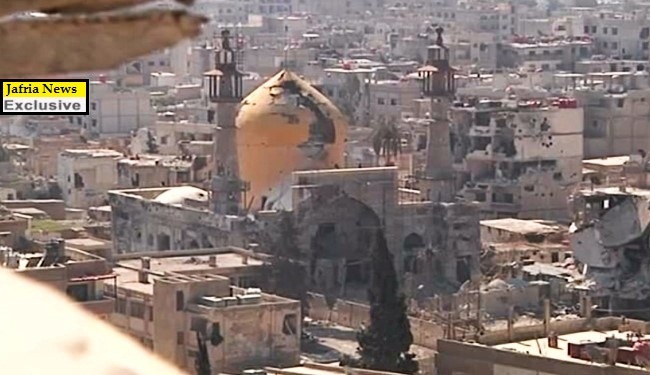 The holy shrine was badly damaged under a year-long occupation of foreign-backed Takfiri militants. Syrian troops have driven out militants inside the shrine and areas around the holy site. “We are defending our homeland and this holy site. We already took control of the shrine and areas around it and are ready to counter any attack by Takfiri militants,” a Syrian army officer told Our Correspondent on Wednesday. The Syrian army is pushing ahead with its mop-up operations against foreign-sponsored militants operating across the country. In recent weeks, the Syrian army has made major advances in its fight against the armed groups. Syria has been gripped by deadly unrest since 2011. According to reports, the Western powers and their regional allies — namely Qatar, Saudi Arabia and Turkey — are supporting the militants operating inside Syria. This entry was posted in Middle East and tagged holy shrine, Imam Hussein, militants, Sayeda Sukayna, Syria, syrian troops. Bookmark the permalink. kill all the infidel terrorists and drive them away from syria . not a single saudi-wahabi be left in shaam .